Thar Block II power station, also known as Thar Engro, is a proposed coal plant in Pakistan. The map below shows the construction site near Thar Block-II, the mining area where the plant will be built in Sindh province. 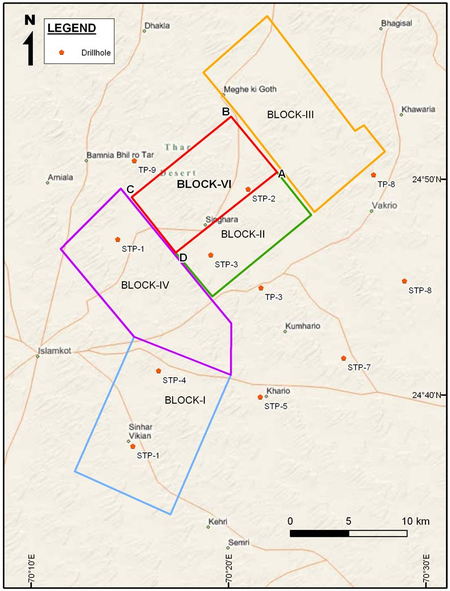 In October 2009, the Sindh government set up a joint venture company — the Sindh Engro Mining Company —on a 40:60 ratio for exploration in Block 2 of the Thar area, done through international competitive bidding. The company planned to develop an open pit mine of 6.5 million tonnes per annum capacity initially which would be scaled up to 22.5 million tonnes per annum subsequently. Power generation would be carried out by Engro Power Gen. Initially, 1,200 megawatts would be generated and it would be raised to 4,000 MW. The first megawatt of electricity from Thar into the national grid was planned for 2015-2016. A licence had also been granted for an experimental project on coal gasification. The Sindh government in Pakistan signed a $30 million agreement with the World Bank for the Thar Coal and Power Technical Assistance Project (TCAP). However, in May 2010 Pakistani news outlets reported that the World Bank had withdrawn from the project. One anonymous government official stated that "major reasons for the World Bank's withdrawal from the project is lack of emphasis on Thar coal resources in our national energy policy and our failure to highlight these reserves as critical for our national security." One issue reportedly of concern to the World Bank was the resettlement of local people. In 2011, Sindh Engro Coal Mining Company’s Chief Executive Officer Khalid Mansoor warned that delay in provision of infrastructure like water and transmission lines might jeopardise the $3.4 billion coal project at Thar. The joint venture between the Sindh government and Engro and is scheduled to produce 1,200-MW in the first phase by 2015-16 and 4,000-MW in the second phase by 2020. In a presentation on Thar coal to Prime Minister Syed Yousuf Raza Gilani in Karachi, Mr Mansoor said that lack of grant payment of Rs10 billion by the federal government had created financial difficulties for smooth running of the project. Thar Coal Energy Board Managing Director Ajaz Ali Khan endorsed the views of Mr Mansoor and said that the vital infrastructure projects for Thar coal development was needed by 2015, at an estimated cost of Rs148 billion. Khan requested the prime minister to organise an international conference donors such as the World Bank, the International Finance Corporation and investors from China, USA, UK, Japan and the Middle East for attracting foreign direct investment in Thar coal projects. On May 14, 2011, Pakistan's Federal Finance Minister Abdul Hafeez Shaikh assured the Thar Coal Energy Board (TCEB) that the federal government would provide "all possible assistance and funding" for infrastructure development for the Thar coalfields. He gave this assurance at a meeting of the TCEB chaired by Sindh Chief Minister Syed Qaim Ali Shah, which gave an update on infrastructure development projects that included a water supply scheme of Makhi-Farash, transmission network, railway link, effluent disposal, etc. The meeting also discussed infrastructure projects that included a water supply scheme for Thar coalfields, a 296-kilometre-long road from Karachi to Islamkot via Thatta, and an airport at Islamkot with an estimated cost of Rs972 million. According to official sources, the chief minister emphasized that the development of Thar coal was the "central policy agenda of the government" and "indigenous resources could resolve the chronic energy problems of Pakistan for the next 100 years." TCEB, on the basis of recommendations of the committee, allocated coal blocks offered for bidding to various local and international bidding companies based upon the companies' financial strength, mining capabilities and project timelines. The chief minister noted that a fiscal incentives package for indigenous coal-based projects had been approved. In January 2014, Prime Minister Mian Muhammad Nawaz Sharif and former President Mr. Asif Ali Zardari inaugurated wok on the project, which was described as a join venture between the Sindh government and Engro Corporation. The joint venture is named Sindh Engro Coal Mining Company (SECMC). An announcement by Engro stated that "initial production will cater to around 600-1200 MW" and we "gradually scaled" to 5,000 MW. A wholly owned subsidiary of SECMC by the name of Thar Power Company (THARCO), incorporated in 2013, will develop the power plant. In December 2014, "Engro Thar Coal-fired Power Plant 660 megawatts" was listed among the "Significant Energy Projects" totaling 10,400 megawatts agreed upon as part of the China-Pakistan Economic Corridor. In June 2015 it was reported the power station would be 660 MW at a cost of US$2.05 billion: the mining will cost $950 million and the power plant $1.1 billion. The Private Power and Infrastructure Board approved the 660 MW power station, but the sponsor still needs to apply for a generation license. As of April 2016, SECMC has acquired 6,000 acres of land for Phase I of the coal mine project, and is working on acquiring another 8,000 acres for Phase II. Construction on the mine was slated to begin April 2016; the mine is scheduled to begin production in early 2019, and the coal power plant "soon after". In May 2016 it was reported that financial closure of phase I had been achieved and construction had begun. In November 2016, the project's sponsors said the plant would be completed ahead of time in Q2 2019. A June 5, 2018 updated list of "Upcoming IPPs" by the Ministry of Water & Power states unit 1 will be commissioned in December 2018 and unit 2 in June 2019. In December 2018 it was reported units 1-2 were nearly complete and would be operational in 2019. A further 660 MW unit is proposed as a second stage of the project. The second 330 MW unit of phase II later became a separate project being built by Hubco, known as the Hubco Thar Block II minemouth power station. In October 2016, the Sindh Environmental Protection Agency (SEPA) held a hearing on the proposal by Thal Noval Power Private Ltd (TNPTL) to build a new 330 MW coal plant based on lignite coal from Block II. TNPTL is a joint venture between Thal Limited (part of House of Habib) and Novatex Limited (part of Gani & Tayub group). The new 330 MW Thal unit was permitted in May 2016. In April 2017, TNPTL signed an Engineering, Procurement, Construction (EPC) contract with China Machinery & Engineering Corporation (CMEC) to develop the 330 MW coal plant in Thar. A June 5, 2018 updated list of "Upcoming IPPs" by the Ministry of Water & Power states unit 3 will be commissioned in March 2021, with financial close "in progress". A December 17, 2018 updated list of "Upcoming IPPs" by the Ministry of Water & Power states unit 3 is under construction. Sindh Engro Coal Mining Company (SECMC) is a joint venture owned 51% by the government of Sindh and 49% by Engro and Associates. The project comprises two parts, a mining project under SECMC and a power project under Engro Powergen Thar Ltd (EPTL). Subsequent phases - 4 x 660 MW supercritical coal plants supported by an additional 15.5 Mtpa of mining. In June 2015 it was reported that China will provide US$200 million out of $950 million for the proposed mine and will finance $625 million out of $1.1 billion for the power generation. In August 2015 a consortium of Chinese and Pakistani banks committed to fund the project. The project’s total debt component is US$1.5 billion, out of which $800 million will be financed by Chinese banks including China Development Bank and Industrial and Commercial Bank of China. Another $200 million will be arranged by China Machinery Engineering Corporation, the contractor of the power plant. Sindh Engro Coal Mining Company sponsors have contributed equity of US$500 million, with local bank lenders including HBL, UBL and Bank Alfalah. The National Electric Power Regulatory Authority has approved a tariff to ensure a 20% rate of return on the project. In December 2015 the People's Republic of China granted approval for an investment of US$1.2 billion for establishment of a 660 MW coal plant and surface mining of 3.8 MTPA (million tonnes per annum) of Thar coal. In April 2016 the project reached financial close. Shareholders of both companies (Sindh Engro Coal Mining Company and Engro Power­gen Thar Ltd) will inject about US$500 million. A syndicate of local banks will provide $500 million for the mining and about $240 million for the power plant. The local syndicate is led by Habib Bank, United Bank, Bank Alfalah, Natio­nal Bank and Faysal Bank. In addition, a syndicate of Chinese banks consisting of China Development Bank, Construction Bank of China and Industrial and Commer­cial Bank of China are providing $820 million loans for the project. ↑ 1.0 1.1 1.2 "Centre to provide funds for Thar coalfield development" Dawn.com, May 14, 2011. ↑ Ibrahim Sajid Malick, " World Bank abandons coal project in Pakistan", Pakistan Headlines Examiner, May 16, 2010. ↑ "Sindh Engro coal project enters crucial phase" Jinah Se Quaid, date unknown. ↑ SECMC's Thar coal mining project, Business Recorder, 12 Apr. 2016. ↑ Thar coal power plant to kickstart by June 2019, Geo.tv, 15 Nov. 2016. This page was last edited on 2 January 2019, at 21:43.